The Taylor C712 is a very high capacity pump fed, twin flavour soft serve machine. 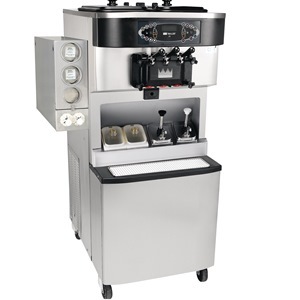 It’s the perfect addition to any business looking to serve soft ice cream or frozen yoghurt in high volumes, quickly. This soft serve machine can make up to 1000 2.5oz portions per hour, so it’s perfect for very high demand, high traffic outlets. To find out more please fill out the quick form above the product image; one of our product experts will be in touch shortly to discuss your requirements.